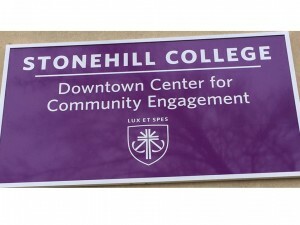 Since its founding, Stonehill College has been present in the city of Brockton in a multitude of ways. 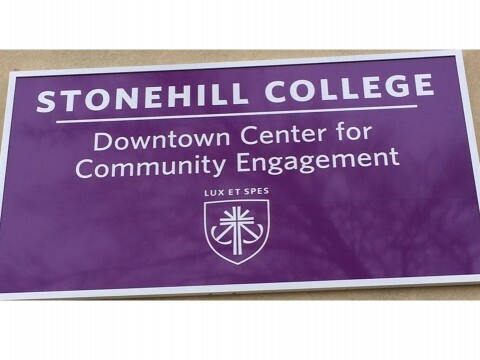 In order to deepen our commitment to the city and our community partners, The College in partnership with HarborOne Bank, has created the Stonehill Downtown Center for Community Engagement (DCCE). The DCCE intends to be a hub for community development, nonprofit resource sharing, and civic engagement for students, faculty, staff, and our broader community of neighbors in Brockton and beyond. Find the DCCE on facebook! The Stonehill College Downtown Center for Community Engagement welcomes community and campus partners that work toward creating a more just and compassionate neighborhood, and beyond. Through access to physical space, a robust professional network, and increased opportunities for collaboration and innovation, the DCCE builds capacity for all students, staff and faculty who are engaged; as well as the local nonprofits that are supported within the space. The DCCE is an incubator for co-creation of innovative solutions to local social problems by community partners, students, faculty and staff. Solutions are developed in our nonprofit incubator space, where organizations are supported and trained to build capacity and meet mission guided goals, and by community based research projects or service learning experiences that happen in our classrooms or in the Downtown Development Lab. Leadership is developed and cultivated through shared workshops, community building, and student engagement in our neighborhood. 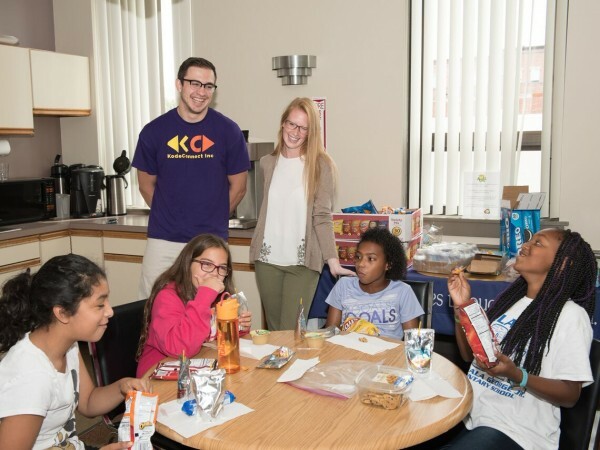 This summer the DCCE hosted a 10 week summer camp experience with KodeConnect, in which 14 Brockton students learned basic elements of coding. Collaborating with CBL, the Computer Science Department, and a locally based tech nonprofit, was a perfect equation for a successful DCCE program. 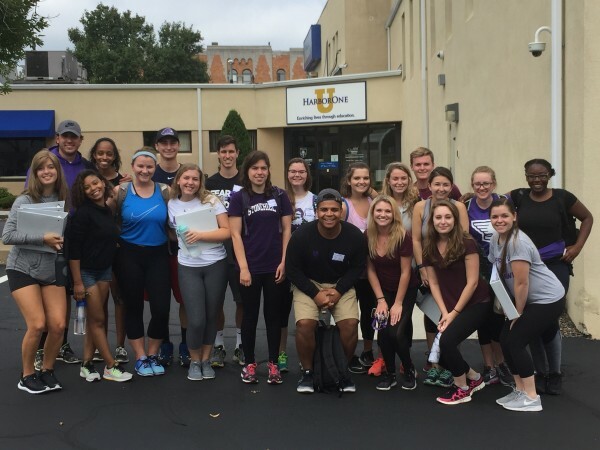 Looking for a space to host a student leadership retreat, club meeting, or community classroom experience? Through connections with local restaurants, lawmakers, small businesses, and community agencies, the DCCE is a perfect location for off campus, high impact, student experiences. Adult alternative education courses, College Unbound & Clemente. 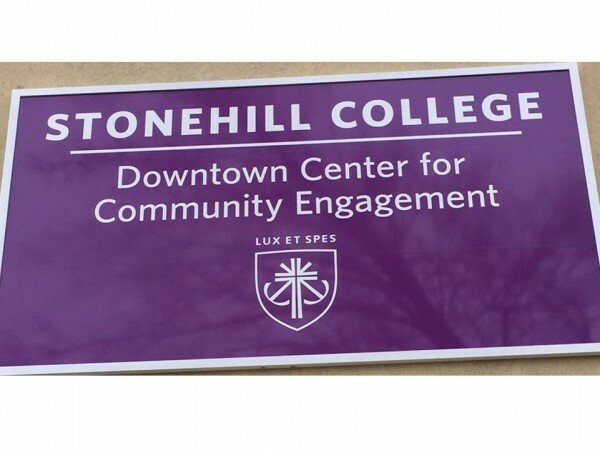 New applications for Incubation Space partners will be available in June 2018, however if you'd like to express interest in a partnership at the DCCE- please email downtown-center@stonehill.edu.